Apple's New MacBook Air Wedge Design Patent Could Destroy Ultrabooks. Sigh. Apple has been awarded a patent for the wedge design of the MacBook Air. The definition of the design is broad enough to cover many ultrabooks, extending Apple's apparent ownership of black rectangles to thin, vaguely katana-like triangles. 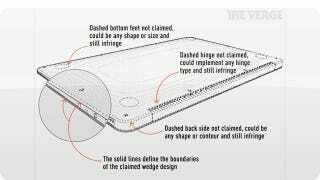 The design is defined by the solid lines in the patent drawings—the dotted lines are what Apple deems irrelevant to the overall patented design. So really, any laptop that is wedged could fall into this category. Even machines like the new Lenovo X1 Carbon, or the Dell XPS 13, both of which are substantially different from the MacBook Air, but are shaped kinda the same sort of a little. Ugh.